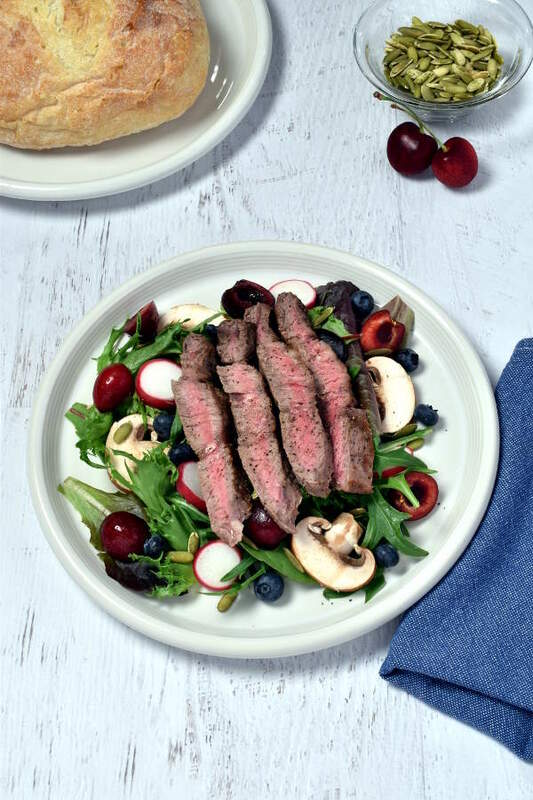 Sirloin steak strips are paired with sweet cherries and blueberries and served on a bed of salad greens. Pumpkin seeds add crunch, and a tangy honey vinaigrette ties the flavors together in this entrée salad. We are definitely steak fans here. 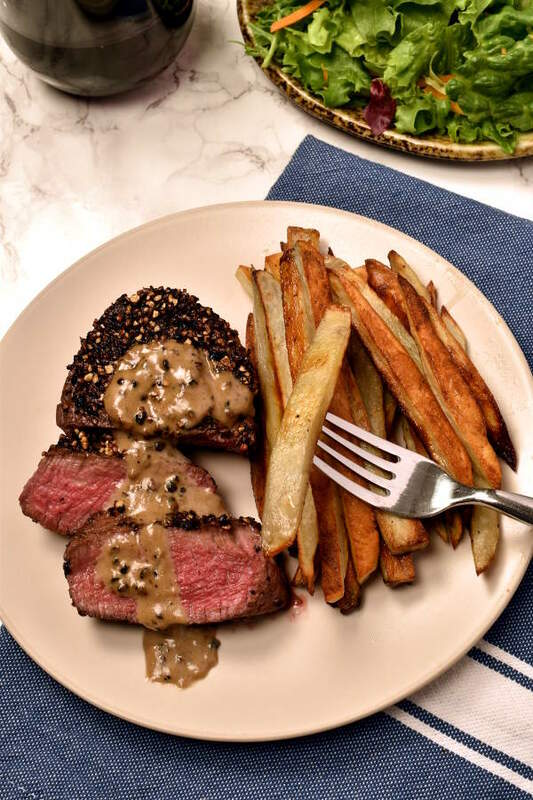 If you haven’t already noticed, check out my recipe for Steak with Homemade Potato Chips, Steak au Poivre (Peppercorn-Crusted) with Oven Fries, or Steak Stroganoff. 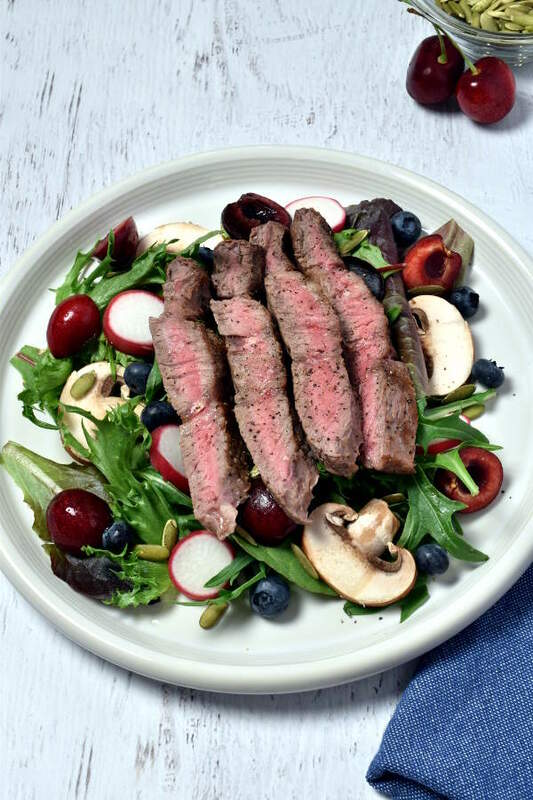 Steak salad is a great way to enjoy some summer produce and turn your salad into a full meal. Just serve with a side of bread for your carbs. 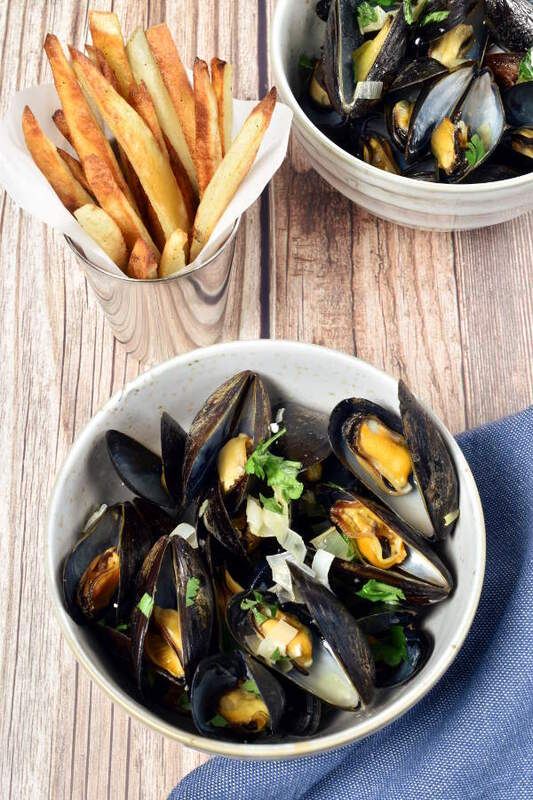 This recipe takes 30 minutes tops, and only requires 10 minutes of actual cook time, meaning it won’t heat up the kitchen. Of course, if you love to grill, you could make this with grilled steak too. I eat frozen cherries year-round, usually cooked in my oatmeal. With fresh cherries available now, I have to take advantage and eat them raw, in salads, with cereal, or just by themselves. 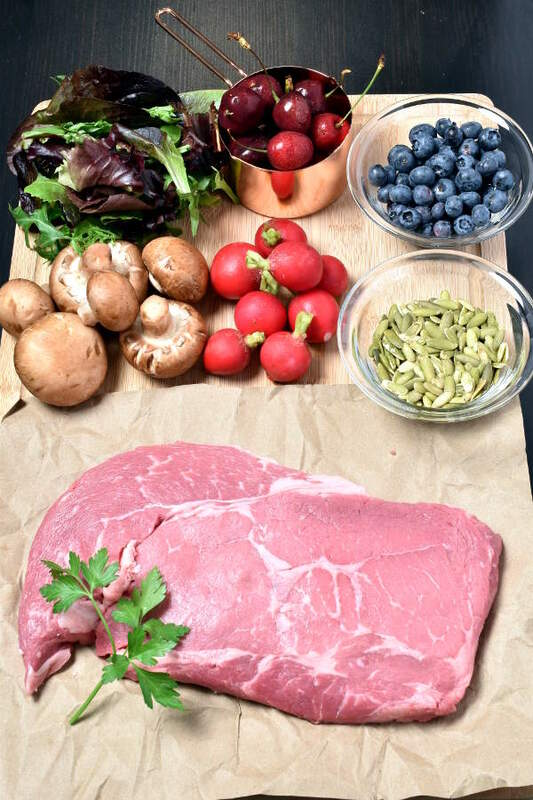 You know how red meat is usually paired with red wine? It’s because the rich flavor of a good steak can stand up to a strong wine. It’s similar with cherries. The steak and cherries really complement each other, and neither flavor overpowers the other. I added in radishes for some crunch and a little bit of zing. The pumpkin seeds also add a nice texture contrast. I feel like mushrooms and steak just go together. I particularly like raw mushrooms in salads because they soak up the dressing and get a little soft. Speaking of the dressing, this is my standard vinaigrette. 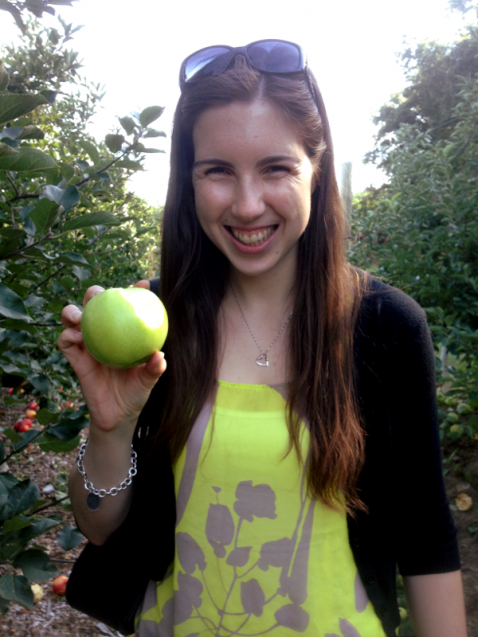 I’ll have to get more adventurous as I continue to blog, but my standard homemade salad dressing doesn’t change much. 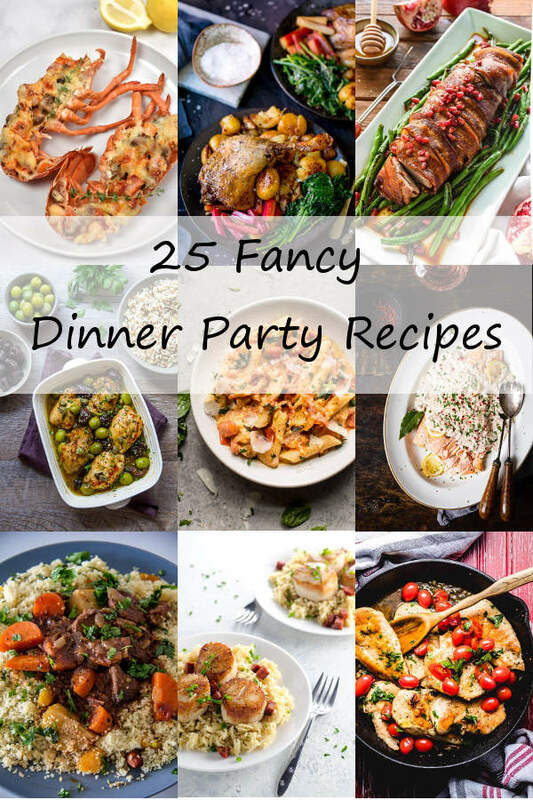 It uses olive oil, red wine vinegar, honey, lemon juice, dried herbs, and salt and pepper. If you have leftover dressing, it will probably solidify in the fridge. 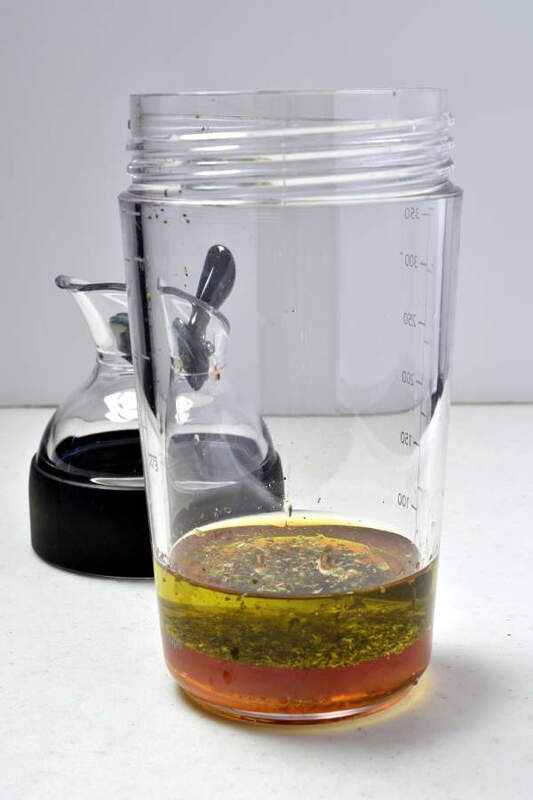 I recommend either making the dressing right before using it or microwaving it a little to help the oil re-liquefy, then shaking it up again. Here are most of the salad ingredients. That’s a pound and a half of sirloin steak. Flank steak also works well. Plus we have cremini aka baby portabella mushrooms, radishes, shelled pumpkin seeds aka pepitas, blueberries, cherries, and a small fraction of the salad greens I used. The only part you have to cook is the steak, just five minutes on each side. Or snack. I packed the leftovers for my 4pm work snack, and my coworker commented on how fancy the salad looked. 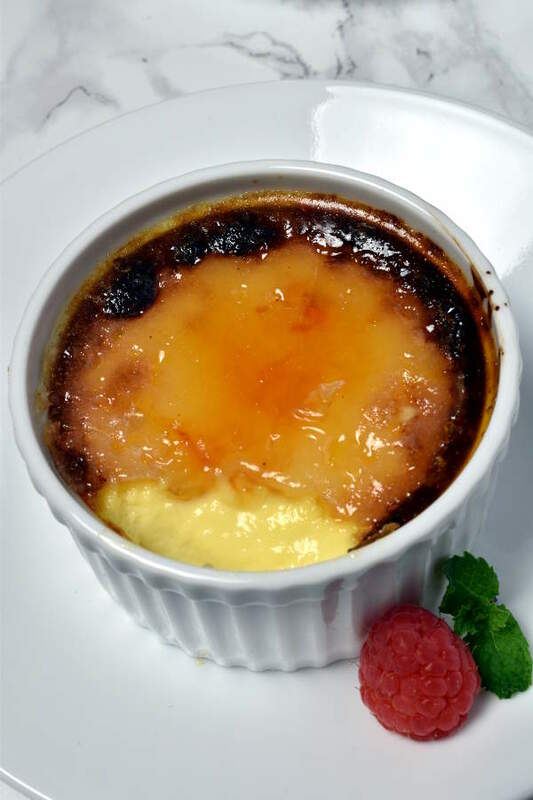 Programming note: There won’t be a new recipe next Wednesday. Hope you have a happy Fourth of July! Make dressing. Mix all dressing ingredients together in shaker bottle or small bowl. Set aside until ready to use. Cook steak. 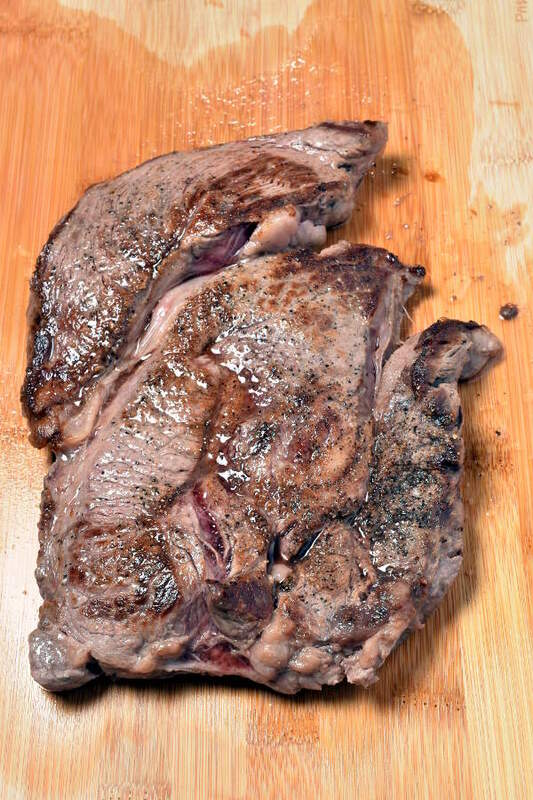 Pat steak dry and season with salt and pepper. Heat oil in a large cast iron skillet over medium-high heat. Once hot, cook steak for 5 minutes. Flip and turn heat down to medium. Cook 5 more minutes. Remove to a cutting board and tent loosely with aluminum foil. Let rest 10 minutes. While steak is resting, continue to next step. In a large bowl, gently mix together salad greens, mushrooms, radishes, cherries, blueberries, and pumpkin seeds. If you are serving the salad immediately, you can also toss the dressing in with the salad in this step. If you will be eating some of the salad as leftovers, wait until you’re going to eat it to dress it. Slice steak into thin strips. Divide salad between serving plates and top with steak. 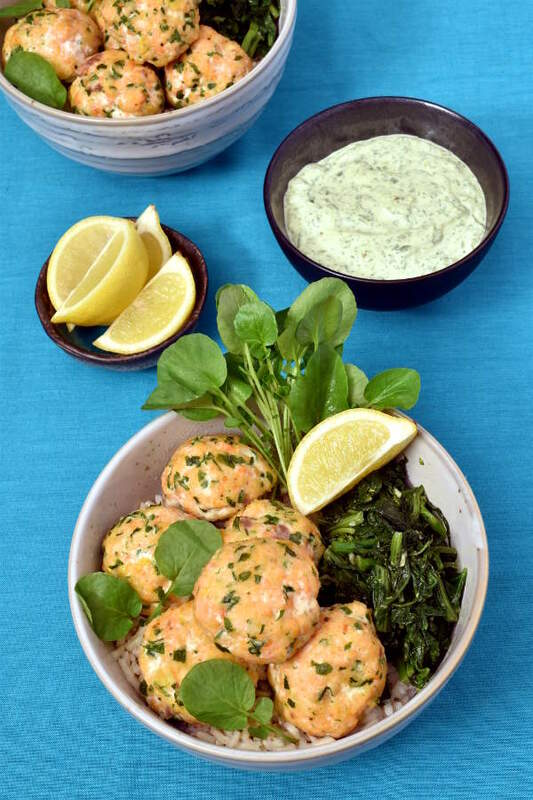 Serve with fresh cracked pepper on top if desired.